When you look at the projected group of forwards for the Edmonton Oilers in 2012-13 there are a few things that jump out. The amount of young, dynamic, offensive talent jumps out right away. There are also key veterans mixed in for leadership and experience purposes, and then there are traditional bottom six role players. What you don’t see is that prototypical power forward. That guy to take up space in front of the net, or run over people on the way to it. The closest thing on the roster so far is perhaps Taylor Hall or Ryan Smyth. Neither have the size or strength to fulfil that role in its truest form. Smyth certainly brought an element of it and was a bulldog in the blue paint in his heyday, but he’s past his prime and will likely not be in a top six role. For Hall, with his injury issues over the last two seasons, the Oilers no doubt would like him to scale back his reckless abandon. With players such as Hall, Eberle, Nugent-Hopkins, Yakupov, not to mention Gagner and Hemsky, all of the above bring a tremendous amount of offensive skill and dynamic puck skills, but none bring a lot of size or power. The Oilers would love to add someone to play in their top six that can create space and be a handful for opposing defencemen. Someone who can plant himself on the doorstep on the powerplay and be downright nasty to play against. 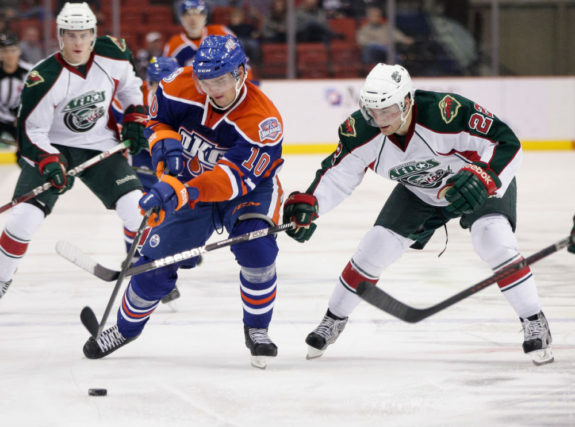 The Oilers are hoping that Teemu Hartikainen can turn into that type of player for them. He may never turn into Milan Lucic, but he has the tools to be an effective power forward in the NHL. A sixth round draft pick in 2008, the native Finn has been given brief opportunities over the past couple of seasons, but hasn’t looked ready and did not make an impression that warranted him staying with the big club. This season is a little different. With the current lockout, Hartikainen is getting a chance to play with some of the Oiler stars in Oklahoma City, and he is making the most of it. Currently fourth in team scoring with 9 points, he is trailing only well known names like Schultz, Eberle and Nugent-Hopkins. He has seen some time on the top line with Taylor Hall being out and even with Hall’s return he has stayed on the first powerplay unit, lining up with Hall and the three previously named players. The longer Hartikainen can sustain his strong play, the better his chances are of cracking the big league roster when NHL play resumes. The fact he is showing some chemistry with the regular Oiler players is only helping his chances. Often described as a “Tomas Holmstrom clone”, he has good size and strength, he’s gritty and loves to battle. The key, however, has been Hartikainen’s improved skating. He has always had the size and power forward mentality, but his skating has always been considered well below par. He has worked hard on improving that aspect of his game and while he may never win any fastest skater competitions, it is no longer a liability and the reason holding him back. While he needs to continue to improve in that area to be a factor at the next level, he is on the right track and has taken a step forward so far this year. 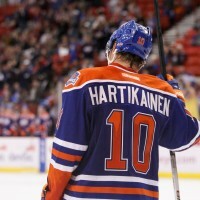 When the NHL lockout is over, Hartikainen will join a small group of players hoping to gain a foothold and make the NHL squad. He is among a group including Magnus Paajarvi, Anton Lander, Chris VandeVelde and possibly Tyler Pitlick who all have chances, albeit to varying degrees, to make the Oilers. The good news for Hartikainen is that he does offer a skillset that the others do not, and he is currently out performing the other players in that group. Whether the lockout ending is imminent or will continue into the new year, Hartikainen is making a strong case to join the Oilers whenever the time comes.